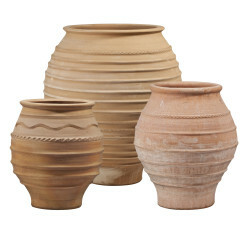 Beautiful in simplicity, these artisan-created pots lend a sense of understated, yet classic elegance to any space. 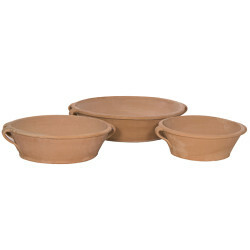 Old flat baptismal pot with three Small handles and drainage hole. Item is handmade so may vary in size, texture and color. Flat, simple conical pot with 2 belts. Handmade with drainage hole. Item may vary in size, texture & color. 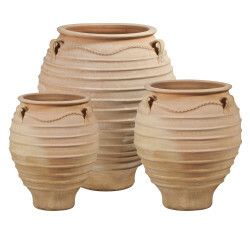 Round pot with several belts & 3 handles. Handmade with drainage hole. Item may vary in size, texture & color. 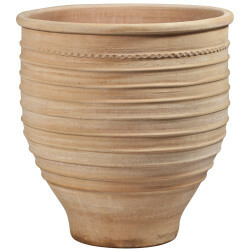 Large, wide round pot with many belts. Handmade with drainage hole. Item may vary in size, texture & color. 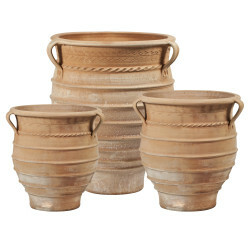 Traditional pot with several bands & 3 handles once used to store corn and wheat seeds. Handmade with drainage hole. Item may vary in size, texture & color. Tall pot with many decorative handles & wide belts. Handmade with drainage hole. Item may vary in size, texture & color. 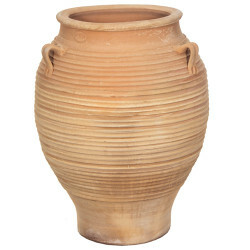 Traditional pot once used for transporting & storing water, with two large handles. Handmade with drainage hole. Item may vary in size, texture & color.